Combine yogurt and Franks Red Hot Sauce. Cut chicken breast in 2x4 inch strips. Put chicken in a large zip lock bag and cover with yogurt marinade. Marinate over night. Put 3 qrts of oil in a large pot. Make sure the oil only fills the pot half way as not to overflow. Use a high temperature thermometer and heat the oil to 350 degrees. Mix 3 cups of rice flour with 3 cups water add a pinch of salt and a pinch of cayenne and make a batter. Toss marinated chicken in remaining 3 cups rice flour until covered with rice flour. Coat chicken in batter and carefully drop in oil. Cook until golden brown and center is cooked. With a metal slotted spoon or tongs remove chicken from oil and lay on paper towel lined plate. Toast waffles golden brown in toaster oven or oven. Melt American cheese on half of the waffles. 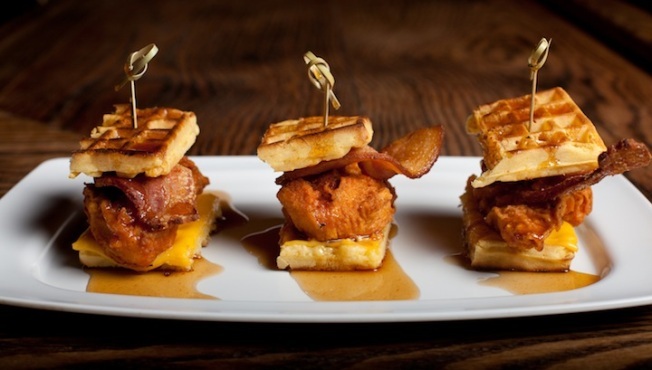 Build the slider by laying the fried chicken on the non-cheese side of the waffle, place bacon on top of chicken, lay cheese side of waffle on top. Put two skewers per waffle longwise and cut waffle in half. Plate 3 sliders to a plate. Sauce each waffle with the spicy maple syrup.